IPSY is a beauty subscription service that sends you an assortment of four to five beauty items in a cute, decorative bag for $10.00 USD. 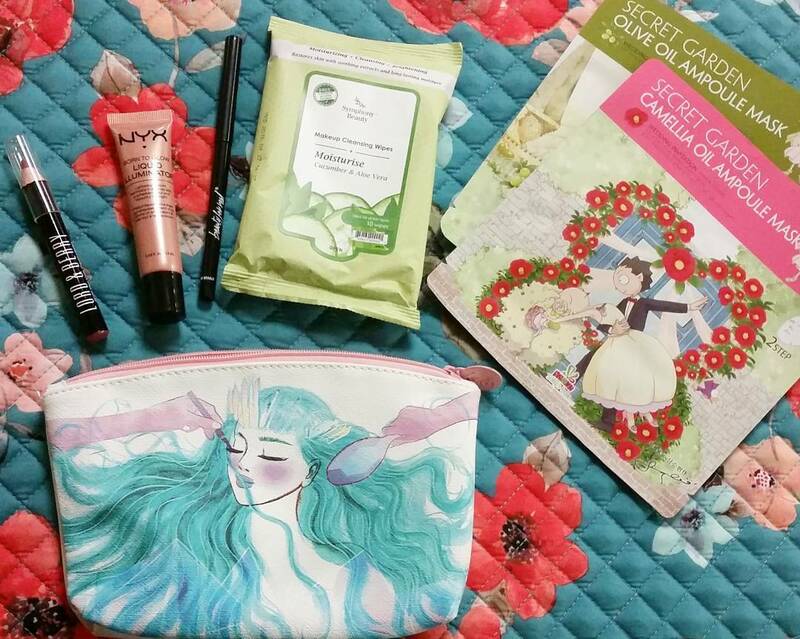 To see what came in the August 2016 Glam Bag, then read this article. It's time for another unbagging of the IPSY Glam Bag and August is probably one of my top favorites. If you don't know what IPSY is, you can read up on it on my IPSY Unbagging from May. But just like the IPSY Unbagging from July, I will list any codes that each brand has at the bottom of the page. This month's theme is Sugar Highness, so the bag has some pastels, blues, and greens. IPSY has been really stepping up their game in terms of bag design lately. I keep saying that a bag is my top favorite every month, but then the next bag that comes along becomes my new favorite. This month's bag is definitely my all-time favorite because of the colors and the amount of detail put into it. 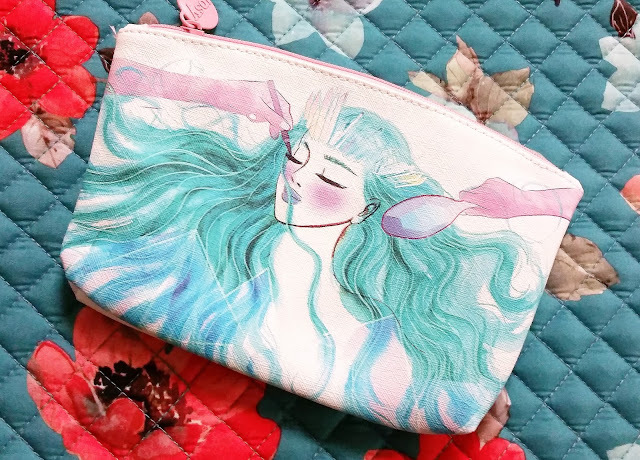 It was actually personally illustrated and designed by IPSY's founder, Michelle Phan, who is pretty much like the OG Beauty Guru of Youtube that made it BIG off the web in the business world. 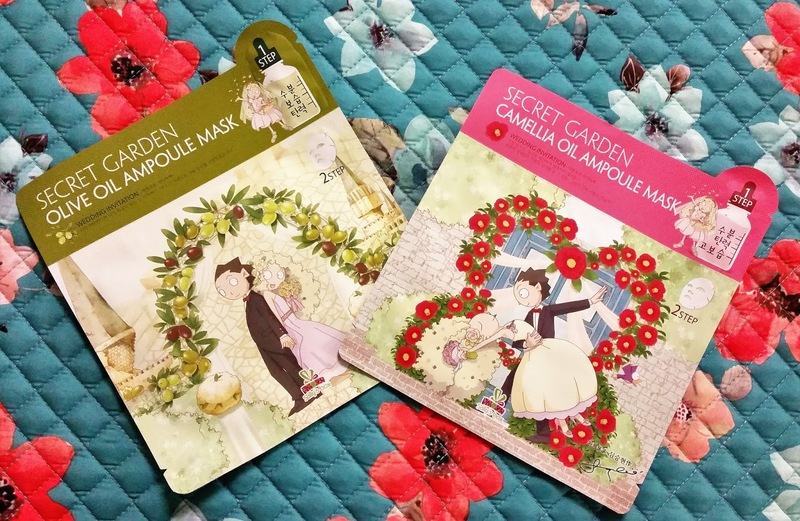 The first item in the bag is actually two skincare items from a Korean brand, Sally's Box Secret Garden Olive and Camellia Oil Ampoule Masks. Their company philosophy is all about moisture and keeping the skin hydrated, which makes me hesitant to use these masks because I'm very oily and acne prone. I have to be careful with anything that's moisturizing because my face is very reactive and will break out. Both are in fact moisture masks, but with slightly different benefits. In addition to being moisturizing and lifting, the olive oil mask is used to sooth while the camellia oil mask is almost a complete moisture mask. I'm pretty sure a lot of people are aware of the skin benefits of olive oil, especially those that do a lot of natural or DIY skincare so I'm not going to go into detail about it. It doesn't clog pores, so it's fine to use on acne prone skin. On the other hand, camellia oil is something I would use at your own risk because it is still questionable about whether it is comedogenic or not. It is anti-aging and does aid in the fading of acne scarring though. I'm not a fan of getting one-time use masks from beauty subscriptions because with skincare you need to use them over a period of time to see any improvement in skin quality. There are some skincare products that you can feel a difference after one use, but that's an exception. Though, one or two times is normally enough to gauge for a skin reaction, which I'm going to try the olive oil mask first. If my skin reacts to that one, then I'm either going to give away the camellia oil mask or chuck it. In addition to their cute packaging, what sets these masks apart from other Korean skincare masks that I've seen is that these are actually a two-step system. The first step is a serum that's located in the upper right corner of the packaging and the second step is the actual mask. The next item is a travel-size pack of Symphony Beauty Makeup Cleansing Wipes, which their products are based in Korean skincare with more natural and luxurious formulas that are supposed to work for all types of skin. I believe they're a US brand because they're based in New York, but their stuff is made in Korea. The kind that I got from them is the Moisturize: Cucumber & Aloe Vera, which are alcohol, sulfate, and paraben free. 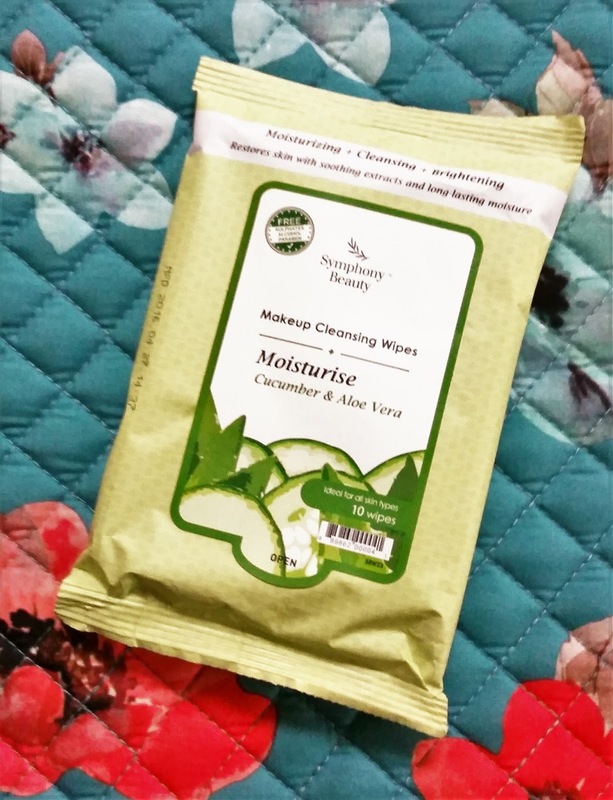 I don't normally use makeup wipes to take off all my makeup because they can be pretty rough on delicate areas and very drying in my experience. At one point, I did run out of my normal makeup wipes (the generic ninety-seven cent ones at Walmart that I probably shouldn't be using) and ended up dipping into the travel pack a couple of times. These wipes actually leave my face feeling refreshed and hydrated. It feels like my morning skin where it's been exfoliated, moisturized, and left to settle away from the elements so I wake up with nice, soft skin. It might just because I use cheap wipes, but these feel kind of thick and hold product for a longer period of time. I've had wipes taken fresh from the pack completely dry out in the middle of taking off my foundation and even rip, but I can take off a whole face of it with one of these. I don't use makeup wipes to remove eye makeup, but these are gentle enough for those delicate areas and I can wipe over the same area more than once without my skin getting rubbed raw. My favorite thing about it is that you can buy these in sixty count packs. I normally don't see a pack above a thirty count in the store for the same price, so I'm probably going to put that code to use. 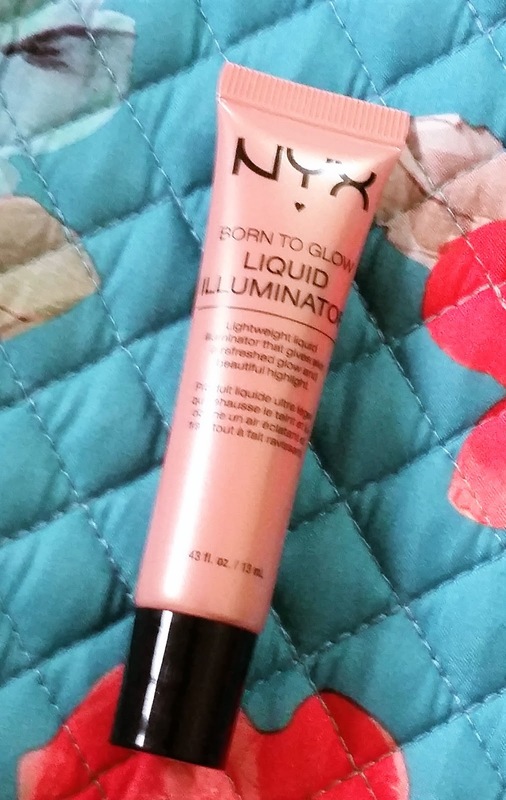 Next item is from a brand that I have reviewed before on my blog and it's the NYX Cosmetics Born To Glow Liquid Illuminator in Gleam. I personally prefer powder highlighters because it feels like they have a bit more weight to them so I feel like I'm getting my money's worth, but I have been meaning to pick up one of these. 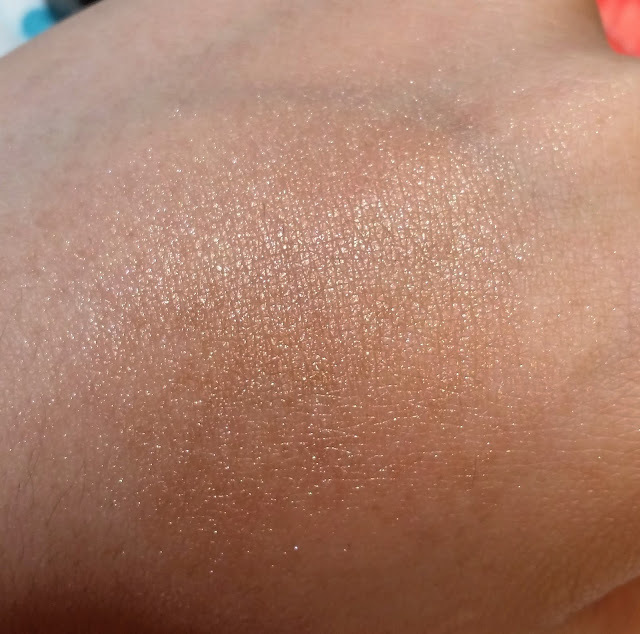 Sun Beam, which is a pale pink shade, is what I would have preferred to get because I like my highlight to either be super light or a crazy color. I don't care too much about not getting it, but Gleam is a golden peach shade that is just a color I normally don't wear: golds, bronzes, and peachy colors just aren't my thing. If I was wearing bronzer or a corresponding blush color that day, then maybe. 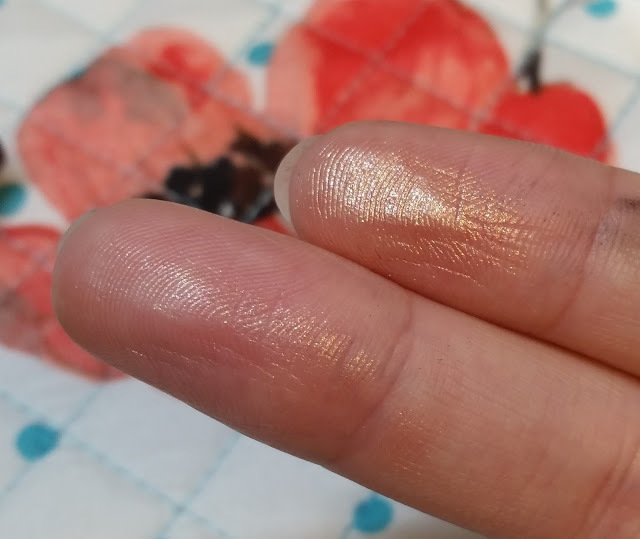 When swatched on the back of my hand, Gleam blends into the skin leaving a shimmery sheen, but it can be built up for more color payoff. My hand is darker with more pronounced yellow undertones, so anyone with a light to medium complexion is going to look more natural in it. If you're more fair-skinned, the color and the gold shimmer of the highlight is going to be more prominent and might make your face look dirty when worn by itself. 'Gleam' Born to Glow Liquid Illuminator blended out. What the 'Gleam' Born to Glow Liquid Illuminator would look like built up. For me, the level of shimmer is subtle. When the coverage is built up, it looks to be slightly less reflective than a light layer of a Jeffree Star Cosmetics' Skin Frost. For a more natural beauty, a light layer should be fine though. 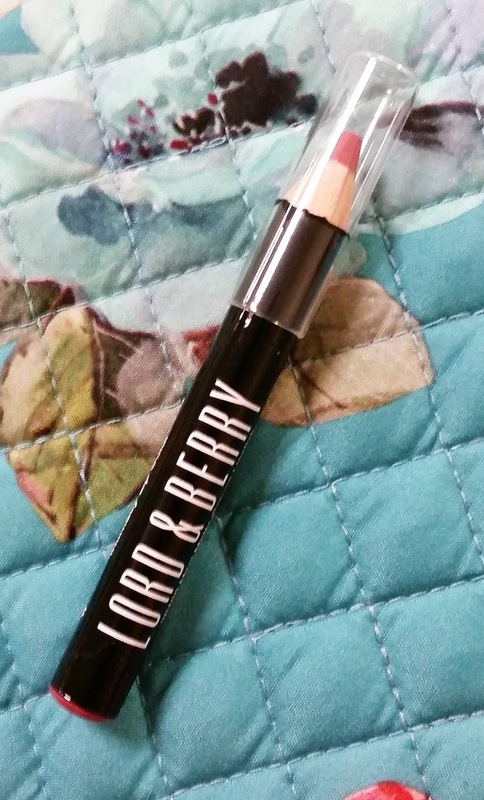 The fourth item in the bag is from Lord & Berry Maxxi Matte Lip Crayon. Like the name suggests, this lip crayon is a matte finish without being overly drying and is very comfortable on the lips. Honestly, it doesn't really feel like I'm wearing anything at all and it glides on with ease with full coverage and color. The particular shade I got is called Intimacy, which is like a pink-mauve shade (my color describing skills aren't very good...thank goodness for pictures). I'm trying to describe it based on a comparison shot (picture below) with the Meet Matt(e) Huges Liquid Lipstick in shade Committed. In certain lighting situations, they're almost dupes for each other. However, in the picture, you can tell the difference in their undertones. Committed is a lot warmer (to where it looks more orange), while Intimacy is more cool-toned and a lot pinker. 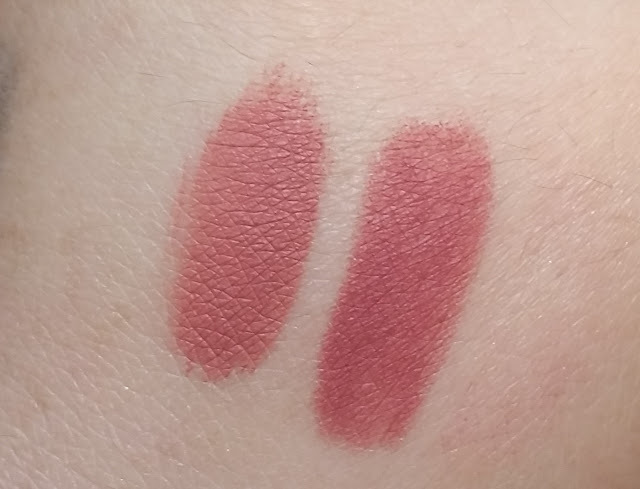 Also, while this doesn't have the same transfer resistance as a liquid to matte lipstick, it has relatively little transfer compared to regular matte lipsticks that come in the tube. 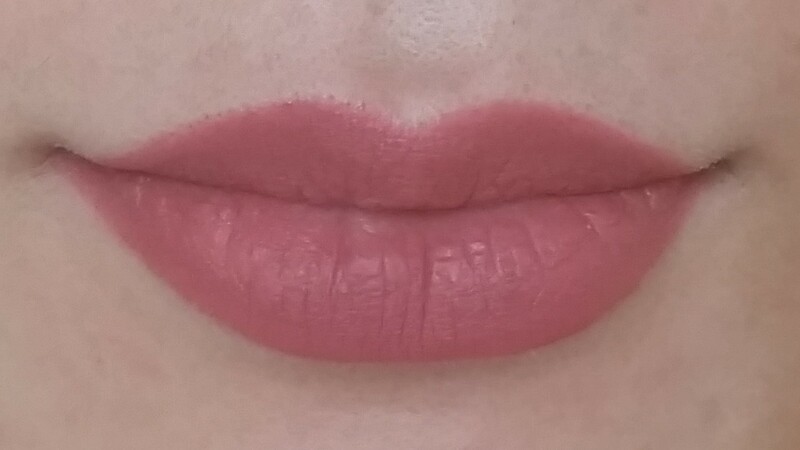 Lip swatch of 'Intimacy' 20100 Maxxi Matte Lip Crayon. Comparison shot of 'Committed' Meet Matt(e) Hughes Liquid Lipstick (left) versus 'Intimacy' 20100 Maxxi Matte Lip Crayon (right). 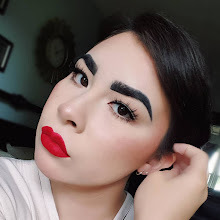 Overall, this product is great for wearing during the day for a lot of people because it's a wearable color that doesn't need a lot of touch-ups. And the last item in my bag is the Beauty For Real I-Line 24-7 Eyeliner. There isn't much information about this brand on the IPSY page aside from the founder being Leslie Munsell, an international makeup artist. She has done makeup for Shakira, Mariah Carey, and Miranda Kerr (i.e. her makeup game is strong with high-quality products). This eyeliner is supposed to be blendable for UP TO TEN SECONDS after application and once it dries, it's waterproof and not going to move. Does it do as advertised? YES! For those that don't know, eyeliner that is waterproof or made to last for long periods of time (e.g. 24/7 Glide-On Eye Pencils by Urban Decay) aren't made to be smudged or blended out. When you do try to blend them out, it has to be done very quickly. This eyeliner provides plenty of time to smudge or blend and does it effortlessly. Also when it dries, it will last. 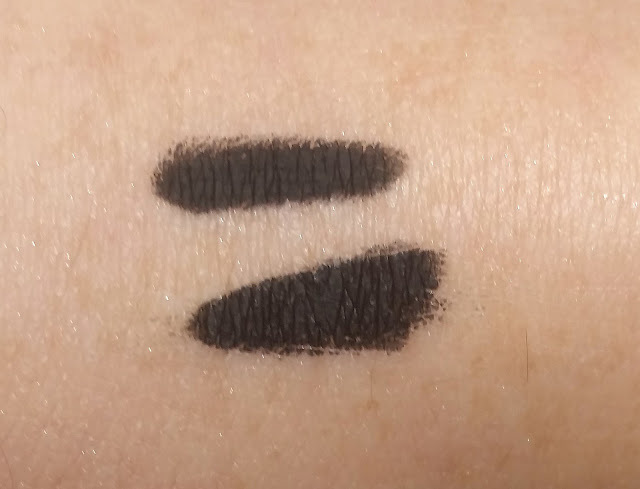 'Perversion' 24/7 Glide-On Eye Pencil (top) versus 'Black Magic' 24-7 Eyeliner (bottom). I really like using it to tight-line because Black Magic is so BLACK. 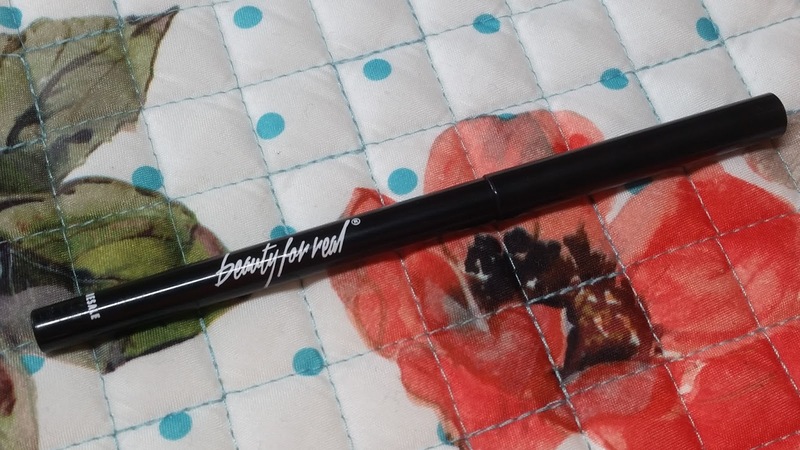 It seems slightly more black than the 24/7 Glide-On Eye Pencil in Perversion by Urban Decay, which I know so many people swear by as their holy grail black eyeliner. The one thing I hate about this eyeliner is the particular winding mechanism they used for the eyeliner. What I mean by that is that this can wind up, but will not retract. I didn't know that when I tried it the first time and wound it up part way. I ended up having to snap off some of the product to get the lid back on, so lesson learned. Any eyeliner that is built like this one will not retract, but this is definitely my new holy grail black eyeliner. And that's everything from the IPSY Glam Bag for August. If you're interested in getting a subscription to IPSY, you can sign up at www.ipsy.com.